On the record and circling the globe. While this is indeed an encouraging commitment, there is a great deal of work to be done before the ban asbestos movement can simply declare victory. Skip the significant new use rule (SNUR) — it only bans 15 obsolete products. Skip the asbestos risk evaluation. Asbestos hasn’t become less of a carcinogen since the EPA tried to ban asbestos in 1989.  Just last month, the bicameral Alan Reinstein Ban Asbestos Now (ARBAN) Act of 2019 was introduced by Senator Merkley, Rep. Bonamici, Chairman Pallone and Rep. Slotkin. In just a few weeks, the bill gained the support of: AFL-CIO, the American Public Health Association (APHA); Environmental Working Group (EWG); International Association of Fire Fighters (IAFF); Natural Resources Defense Council (NRDC); Safer Chemicals, Healthy Families (SCHF), and others. ARBAN is gaining momentum and the media’s attention. Nearly 40,000 Americans die annually from preventable asbestos-caused diseases. 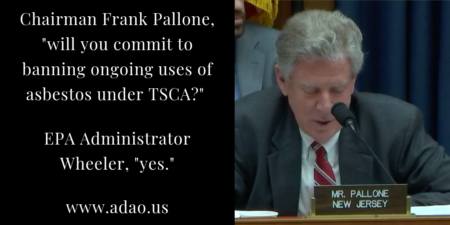 ADAO commends Chairman Pallone for his dedication, diligent, and leadership to hold the EPA accountable for their failure to implement TSCA reform according to The Frank R. Lautenberg Chemical Safety for the 21st Century Act that was signed into law in 2016. Administrator Wheeler, I agree with you — yes, we are going to ban asbestos. Together, we will make change possible.